The SEQARTKIDS Academic Internship program engages undergraduate and graduate students in artistically vigorous and creatively enticing environments. Students with an interest in arts education and youth programs gain professionally-supervised experience and integrate their classroom learning with practical involvement in the facilitation of workshops with professional teaching artists. 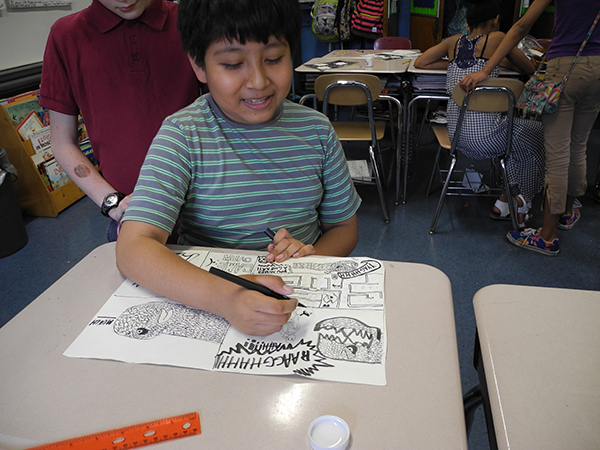 BA, BFA, MA, MFA and other degree candidates gain real-world experience in teaching and education by contributing to the development of interdisciplinary art classes for Brooklyn public elementary school students. Upon familiarizing themselves with SEQARTKIDS' diverse workshops and activities, interns may choose to focus on a specific workshop or topic, utilizing their interests and talents to upgrade the program. Interns may also work behind the scenes on assignments ranging from program administration and documentation to pedagogical assessment and website updating. Academic internships are unpaid but academic credit can be provided in conjunction with the school of the intern. Each year, in conjunction with the Pratt Institute Center for Art, Design, and Community Engagement K-12, one Pratt Institute education student is selected from an open call to partner with a Franklin Furnace performance artist/educator to conduct a practicum in a nearby public elementary school. Adult volunteers are invited to apply for service in all aspects of the SEQARTKIDS program, from assisting in the classroom to helping artists with lesson plans, curricula, and teaching supply preparations, to professional development and grant writing. Please send resume with cover letter by e-mail or snail-mail. We will respond to all applications and arrange for interviews when appropriate.